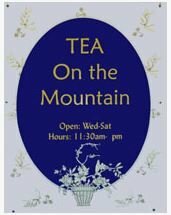 Tea at Tea on the Mountain is extra special, no matter what option you choose. High Tea, of course, gives the fullest rein to Myrna's culinary talents -- fresh baked scones with lemon curd and clotted cream, tasty tea sandwiches, Scotch eggs, morsels from the pastry selections and delectable desserts. If you don't feel up to that much, try one of the other variations -- an Afternoon Tea or a Cream Tea. Any of our Tea offerings are guaranteed to tickle your taste buds.